How do you love an actor through their work? A celebrity, a public personality you've never met, never seen in their private moments, never known as anything but what they choose to put on the screen? A lot of questions, all intellectually interesting. Also, all easier to think about than the instigating event. All effective diversions. I mean, some celebrities don't feel like mere projections, assemblages dispensed by the entertainment industry for the sake of optimal charisma. Some celebrities... some advocates, politicians, comedians, and even comic actors... don't seem to put much of a wall up between their public lives and their private eccentricities and vulnerabilities. Maybe they're just not good at the fakery. Or maybe they're extremely good at it, and my senses haven't caught up. Who knows? You can't fall in love with on-screen personas the way you do with someone whose hand you've shaken at their wedding reception. You can't fall in love with them the way you do a trusted mentor, or a great psychologist. You can't fall in love with them the way you do with your kids as you tuck them in at night, and you can't be connected to them the way you can to a soul-mate whose trials and troubles you've spent a life trying to shoulder. With an entertainer, there's a degree to which it's all pre-packaged, conducted for your benefit, and for the benefit of several billion others who share your unrequited love. But in a mediated age like ours, where we're all managing different aspects of ourselves that are being peeled away in fragments and distributed according to the logic of production, I think it's valid... perhaps even necessary... that we can fall in love with projections, with the ideas that people choose to champion and represent. It's been happening for centuries, after all... people have loved saints and athletes and politicians, in moments of hardship they've loved prophets and revolutionaries, in times of prosperity they've loved artists and emperors. They've loved fictional characters and half-serious delusions. These kinds of love are real, and and their mourning warrants expression. Robin Williams earned our love, and he deserved it. Through the roles he chose, through his commitments to particular characters at particular moments, he came to represent a very specific thing in our culture: the hapless sentimentalist. He was a comic actor -- even his most serious roles were cut with a certain therapeutic irreverence -- but his humor was always an interface with a certain soaring, hopeful, joyful sadness, the kind of heartfelt pathos that's come under siege in the age of smug self-consciousness and detachment. And goddamn! From a young age, I've fallen in love, repeatedly, with what Robin Williams represented. I was in love with Daniel Hillard and Armand Goldman and Jack Powell and Sean Macguire. His roles all took on this fatherly tenderness... even the heroic roles (Alan Parrish in Jumanji) and even, weirdly enough, the twisted and unhinged antagonist roles (Seymour Parrish of One Hour Photo, Walter Finch of Insomnia). As with many kids (not all, I fully realize), I thought my dad was the most heroic human in the world, and in a way, I loved Robin Williams because his roles seemed to be paying tribute to my own dad (Kevin Costner is the only other actor who managed the same thing from time to time). Maybe Williams was so good at this because he also knew how to play a kid, and he knew the power that a father-figure or an older mentor can have over a child. This came through most explicitly in Jack, a lovingly-acted role in a movie that I still think about at the most random times. It's also one of the central dimensions of Hook, which is an affectionate, reconstructed hero story built around the father figure rediscovering childhood. 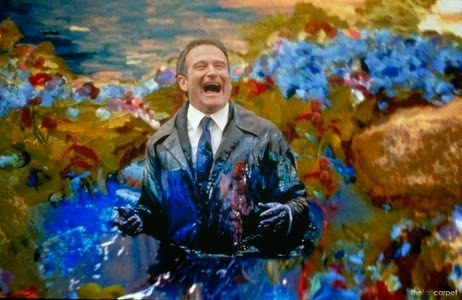 Hook is, incidentally, in a three-way tie for my favorite Robin Williams movie. One of my other favorite Robin Williams characters is the genie in Aladdin. I can't help but see all the good, earnest, loving people I know in that genie... all the people who I've been grateful to have as my mentors and influences. It was a movie all about the relationship between power and dependence and vulnerability, right? About how the greatest power in the world suddenly becomes worthless without the existential sinew of vulnerability and honesty and self-acceptance? My third favorite: Williams' role as Chris Nielsen in What Dreams May Come, one of the great epic journeys, a walk in the shadow of endless cosmic melancholy. Despite its joyful, almost saccharine ending, there's a profound sadness that permeates What Dreams May Come, a sense of futility and submission to the endless cycles and trials and rediscoveries of history. This is, of course, balanced by the redeeming forces of familial love and loyalty and free will, but one of the most beautiful things about the movie is that it finds a delicate balance... the darkness passes, but it remains on the horizon of the film, even unto its rosy final shot. I loved Robin Williams, one of the great father figures of the modern age of cinema, and though his story will always be tinged with melancholy, I hope that for him, the darkness has passed. RIP RW. I've not yet seen What Dreams May Come. I'm looking forward to viewing it over Christmas break. Somewhat ashamed I am to say that I've had the novel on my shelf for over two decades. It was written by Richard Matheson who, among other things, wrote a good number of episodes of The Twilight Zone as well as being rather famous for penning I Am Legend (all of which you probably know). I have several anthologies of Twilight Zone episodes turned into short stories. I've read a number (as well as seen a number) of Matheson's. He's a favorite author of mine. Again...looking forward to watching the movie. After reading this melancholy -yet thoughtful, tribute...I am hesitant to even ask — have you seen his last "official" Hollywood offering? The late-great ROBIN WILLIAMS' (R.I.P. July 21st, 1951 – August 11th, 2014 R.I.P.) final on-screen role in BOULEVARD (2014) was cringe-worthy (ifuknowatimsayin' lol) but overall, it was an "UN-REAL" performance by One of My All-Time Favorite Comedic Actors...the Improvisational Comedic Talent for the Ages, "Mr. Na-Nu Na-Nu!"